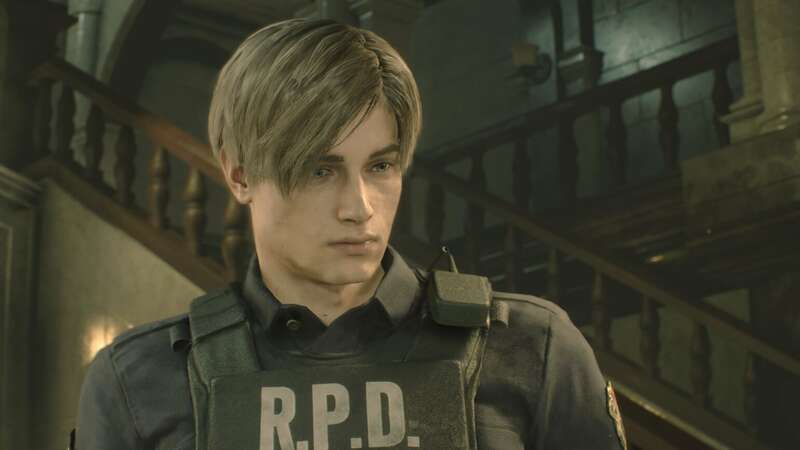 Can Resident Evil 2 Remake Outsell Its Predecessors? The blog is no longer dead. You might call it.. undead! Fittingly, Capcom kicks off a brand new year with another blockbuster January release, which is becoming its signature, with today’s launch of the remake/remaster/re-imagining of the second entry in its classic survival horror franchise, Resident Evil 2 Remake. I’ve recently finished the game, which is based on the 1998 title of the same name, and even as a mostly casual fan I came away more impressed than I originally anticipated. Like the first, you fight through a devastated version of the fictional Racoon City, ravaged by a virus that’s turning folks into brain eaters. 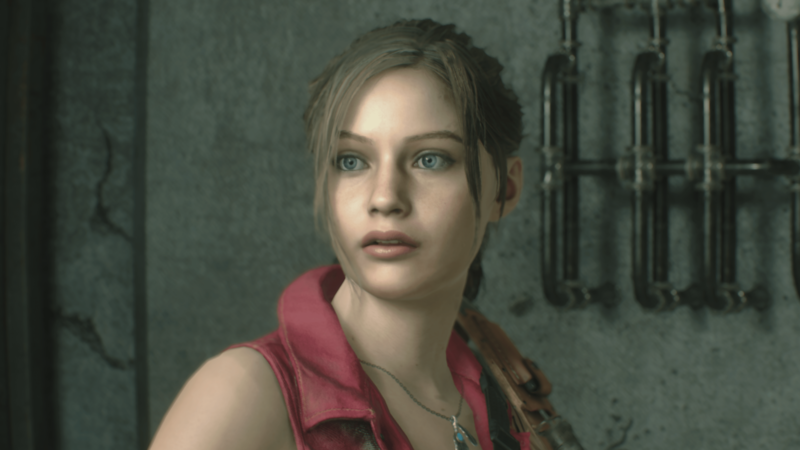 Players can proceed through similar yet diverging story lines from the perspectives of the game’s protagonists: rookie policeman Leon Kennedy and college-student-on-a-mission Claire Redfield. As you’ll see in the video above, it’s a fantastic, total remake in the truest sense. The world in which shady big-pharma company Umbrella Corporation operates is rebuilt in the same game engine used for 2017’s Resident Evil 7. It features an over-the-shoulder perspective, redesigned familiar areas, new puzzles, plenty of undead enemies to fight and jump scares galore that are actually in different places that the original, to keep players on their toes. While I still have qualms with some of its gameplay mechanics, especially a lack of punchy weapon feedback and the opaque, stumbling nature of some puzzles that you need to complete in order to proceed, I will admit Capcom and its R&D Division 1 development team sets a new standard for what this type of product should be. Fans of the original are going to devour it like a hungry zombie does when you turn the wrong corner, and I anticipate it will bring in a substantial new audience as well. Which is great news after stories regarding its difficult development cycle, documented recently by Polygon. Though let’s be honest, I ain’t much of a reviewer. We like to talk business here. With my brief critical thoughts out of the way, let’s turn to the series from a commercial standpoint and do some predicting on where this remake will fall in its storied history. 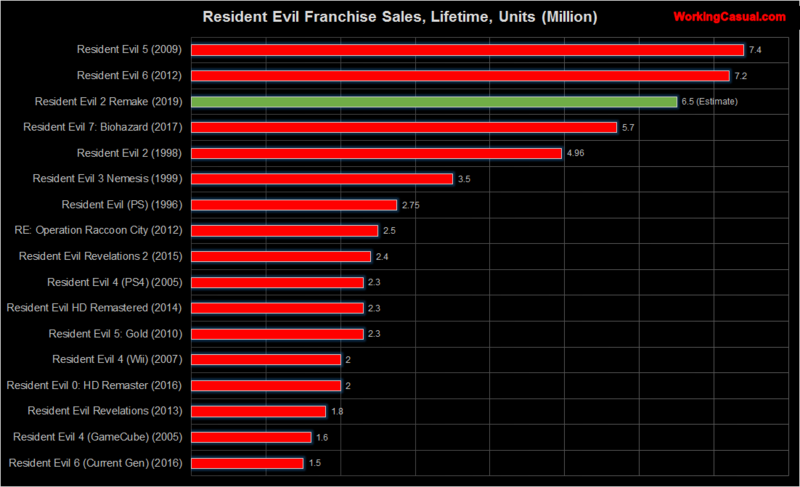 Resident Evil is Capcom’s highest-selling franchise by a wide margin, moving over 85 million copies across its dozen-ish mainline titles and numerous alternate versions, spin-offs, remasters etc. The next closest is Monster Hunter, with 52 million. Four of the company’s six best-selling individual releases ever are Resident Evil games, as you’ll see later in this post. Like the game’s signature G-Virus monster, it’s a behemoth. And a core reason why Capcom remains one of Japan’s most successful game publishers. Especially with the resurgence that began with Resident Evil 7 two years ago, which is approaching nearly 6 million units on its own. 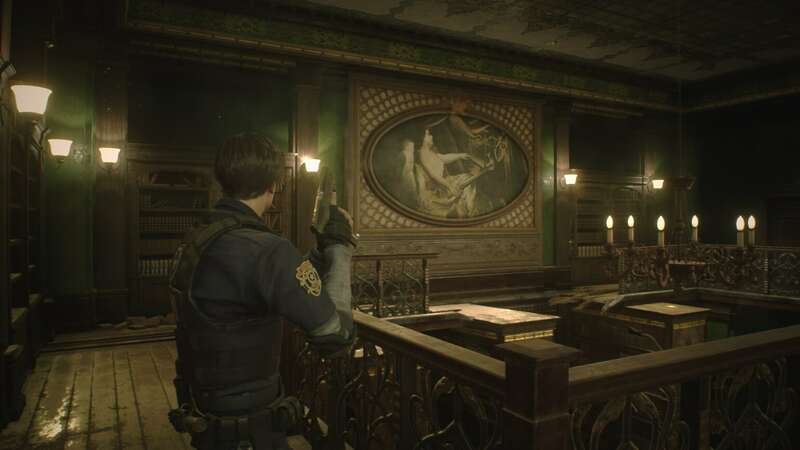 So, can Resident Evil 2 Remake shamble its way up the list to take a bite out of the original and other all-time Capcom best-sellers? I’m betting that it can, and will, do very well. Especially its first few weeks. Though I’m skeptical it can eclipse the likes of the more action-oriented Resident Evil 5 and Resident Evil 6 which are the best-selling in the series at 7.4 million and 7.2 million units, respectively. I expect Resident Evil 2 Remake can and will outpace the original, plus both launch window and eventual lifetime sales of Resident Evil 7. Which will be impressive, considering that the original was the fastest-selling title in North America at the time of its release in 1998, hitting 5 million copies alone during launch year. If I had to put a number on it, which I like to do because anyone can say it will “sell well” and look back like got the prediction correct, I’m leaning in the 6.5 million lifetime range. Check the chart below for some context. I’m thinking it will basically align with Resident Evil 2 for its first year, then have good momentum through early next year as we won’t likely see another franchise title just yet. Why? Early indicators are upbeat, including review aggregators like OpenCritic showing scores in the low 90’s. Critical reception and word-of-mouth has been overwhelmingly positive. Its “1-Shot Demo,” where players could grab a version of the game for free and play for a half hour ahead of release, has been downloaded nearly 2.7 million times as of today. Going further, a well-done rebuild of an older game has the dual appeal of feeling like something totally new while also tickling gamer nostalgia. And I would argue that nostalgia is a more important factor in the medium of games than any other. Especially when it comes to return to an older style within a long-running franchise, plus a remake that’s so expertly-crafted like this one is. Lastly, its release window is darn near perfect. Capcom has been smart in releasing new Resident Evil and Monster Hunter games during the past three January’s now, a month that is usually a slower one for the games industry. The prior two years have seen very impressive commercial showings from Capcom, especially Monster Hunter: World which is currently the firm’s best-selling individual title of all time. And ultimately, I anticipate this smart release timing along with the familiarity of the franchise, nostalgia for a return to older games, the indicators from the demo and the outright quality of this version will drive impressive sales for Resident Evil 2 Remake. So, what about you? Am I being brain dead, and overly optimistic? Or do you actually think the remake will outpace the 5th and 6th installments in the series? Link up here or on Twitter, and thanks as always for.. shuffling through! Sources: Capcom Investor Relations, ResidentEvil.net, Outside Xbox, Polygon, Capcom Fandom, My own Xbox One X for screenshots.